When I was first diagnosed with Type 1 diabetes over a decade ago, one of the first things I learned before I left the hospital was the different places in your body to inject insulin. The idea is to find spots where there's enough fatty tissue. It pretty much came down to this: arms, thighs, abdomen, buttocks. Naturally, the first thing that comes to mind is which spot would be the least painful. This could of course vary depending on the person and his or her body type. For me, at the time, the buttocks area was the least painful. But it's hard to do it on my own and I'll probably get arrested if I do it in public. But there's more to it than just avoiding pain. Below are some tips that should hopefully help those who just started taking insulin via injections. The rate of insulin absorption varies depending on where you inject. Injecting in the subcutaneous tissue in the abdomen would usually result in faster absorption compared to other sites. So if you're having a meal right after injecting, then you'd probably want to inject here. If you're taking your slow-acting insulin just before bedtime, on the other hand, then it probably makes sense to inject somewhere else where absorption is slower. 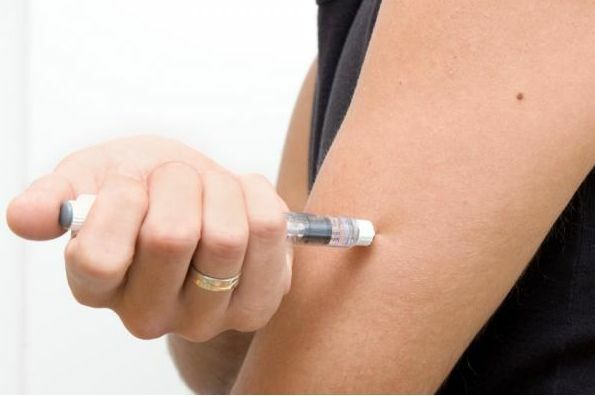 Repeatedly injecting in the same spot can cause lumps and scarring, which would then result in inconsistent insulin absorption. Try to change injection sites if you can or at least spread them out a few inches. If you always use your abdomen to inject, for example, try to spread them out at least an inch or two apart. For example, if you inject insulin into your thigh and you decide to go for a run, insulin will get absorbed faster which may lead to hypoglycemia while you're running. Heat can cause blood vessels to expand, increasing circulation and resulting in insulin getting absorbed faster. You may want to avoid taking a hot shower right after you take your insulin unless you want that increased insulin absorption. It works the other way as well. Cooling the area where you injected can slow absorption. Tip #5: Inject straight or at an angle? If you have plenty of fat for the needle, inject straight in (90-degree angle). If you're very thin, inject at a 45-degree angle to avoid hitting the muscle. Ever noticed insulin leaking out? That's probably because you withdrew the needle too quickly. Waiting 5 seconds or so before pulling out the needle after injecting should help. Your body fat, how you inject, and the amount of insulin you need are worth considering before choosing a needle size. If you're very thin, then you'd probably want the shorter needles so you don't hit the muscle layer when injecting. If you take a larger dose, you may want to pick a needle with a larger diameter for a faster flow so you won't have to push as hard. Do you have additional tips? Please feel free to use the comments section below!